Recent rainfall has caused significant damage to the Industrial Technology building. In recent weeks the northeast Texas region received serious amounts of rainfall in a short span of time causing roads to flood and water damage to local businesses and other residential structures. On the Northeast campus, the accumulating water caused issues with the gutter system as it quickly filled up. The overflowing gutters caused water and moisture to soak into the surrounding walls causing extensive damage to the east side of the building. According to Northeast President, Dr. Brad Johnson, a reported six inches or rain forced the relocation of a number of classes from building. Plant Services Director Tom Ramler, said the efforts to try and dry the building out were ineffective. 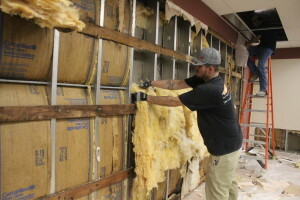 In order to fix the water damage, walls and insulation have been removed by Servpro of Paris, a residential and commercial restoration service company. and will have to be replaced. Ramler also said anything that was deemed harmful in the building, was sprayed to kill possible growth in the walls. Northeast has claimed this incident on the college’s insurance. It is unsure at the moment as to how much of the damages the insurance will pay for, but the college will have to pay the deductible first. The water damage has caused the need to replace the drywall, insulation, the floor electrical and many of the ceiling tiles, along with some carpet and furniture, but there is no damage to the outside brick. Since the walls had to be removed, many classes were relocated throughout campus. Along with the classes, Communities in Schools was also relocated. As classes wind down for the semester Ramler said the he had no worries that the walls wouldn’t be fixed before classes start in the fall. Ramler is currently working on a way to make sure that this same issue doesn’t happen in the future.